Difinitus wrote: Please remember to keep all relevant discussions about the beta in the dedicated beta section of the forums: https://www.celtic-heroes.com/forum/viewforum.php?f=316. If you are in the beta, but can't access these forums, then let me know. Most of these questions have been answered already =)! I’m in the beta, and was in the process of making a big report on the beta forum, yet for some reason I got kicked out and am not currently authorised. Please fix. Issue: When I tried to leave farcrag to go to shalemont, I got a tutorial message saying that I was carrying too many items. This then went into showing me how to buy ley fragments and then backpack expansions. 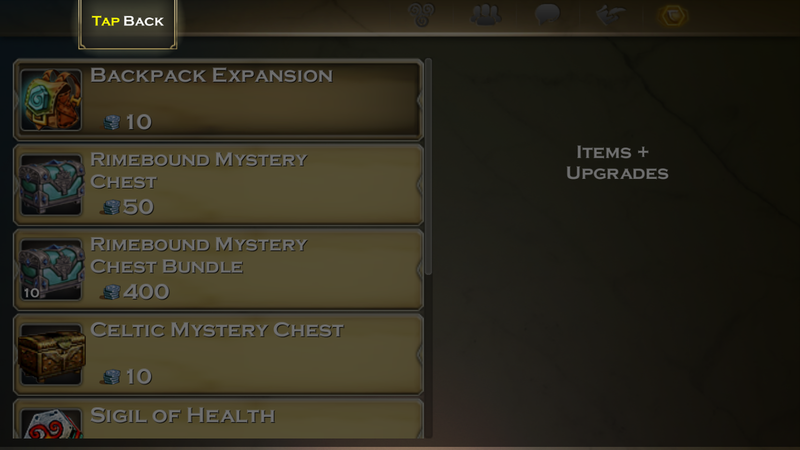 Once the tutorial showed me how to buy backpack expansions. A button popped up at the top left corner saying tap back. However when I pressed this button, nothing happened, and I was stuck on the screen, I restarted the app and the same thing happened. Location: when attempting to travel from farcrag to another area. Steps: 1. Have more items in backpack than you can carry. How do I join the new beta? I had an account on Highland Warriors but a friend informed me that it's no longer that app, is it too late now ? I also cannot access the beta feedback forum and have a few glitches to report on Android platform.